The monsoons are here and with this lovely weather come the extremely abhorring fungus and musty smell in your house. The moist and humid air is a perfect environment for fungi and molds to grow, and leave behind an annoying smell. This musty smell can also be highly detrimental for your health, as they can cause severe allergies and illness. So, here are a few easy tips you can try to avoid the annoying unhealthy smell in your house. 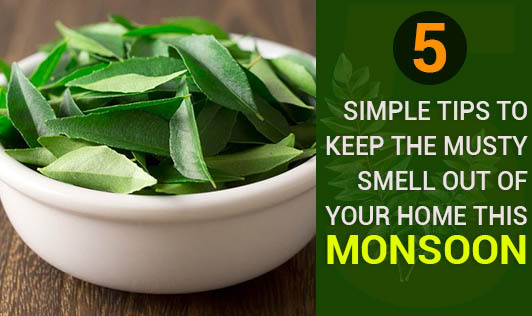 Tip 1: Burn Camphor- Commonly used during poojas and religious ceremonies, camphor can get rid of the fungal infestation and smell in your house. All you have to do is close the doors and windows and light a few pieces of camphor in a steel plate in every room. Let the entire piece burn. Keep the room closed for around 15 minutes to half an hour and you should get a fungus-free room that smells wonderful. Tip 2: Let the Sunlight In- While there are only few days during the monsoons when the sun is clearly visible, try to make best use nature's natural disinfectant when it is available. So, keep your windows and doors open every once in a while. If you do not want to keep the door completely open, open the ones that are diagonally opposite to each other, this will allow cross ventilation and help you get rid of the musty smell. Tip 3: Sea Salt to the Rescue- Sea salt is an amazing, natural way to gets rid of odors. The highly hygroscopic salt absorbs the moisture from the room and reduces the excessive humidity and dampness in the room. All you have to do is take a piece of cloth, place some sea salt or white salt on it and knot it up. Now place the knotted bags in the room. Make sure you change the salt every 2 to 3 days, as it will eventually get saturated and stop working. Tip 4: Fight Odor with Vinegar- White vinegar is very effective, when it comes to fighting bad odor. Just keep a cup of white vinegar in a wide bowl inside your room and allow it to stay as it is for a few days. All the bad smell should be gone. Tip 5: Use the Powerful Neem- These leaves are a form of natural disinfectant and they can effectively keep fungus and mold away from clothes and materials. All you have to do is take a few sprigs and place them in between your clothes and in the corners of your cupboard. The leaves will keep the fungus away and beat the smell in your wardrobe/closet.